The deepening crisis today demands an effort as ambitious as the one launched fifty years ago this week. 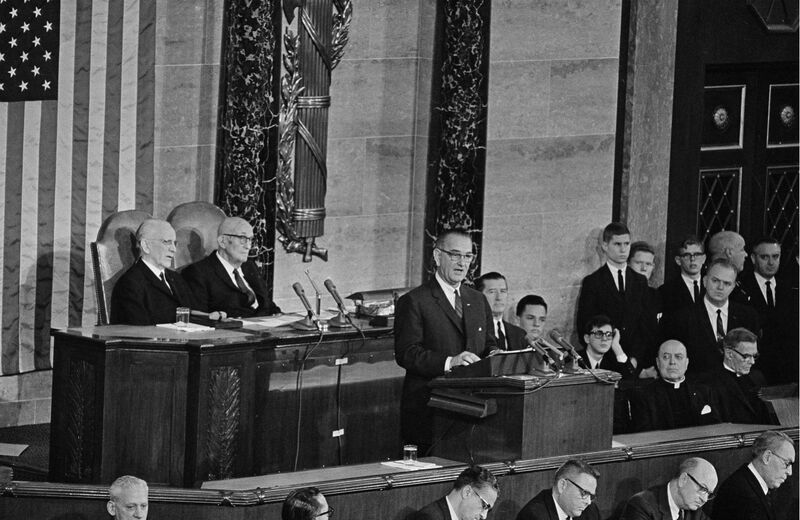 When LBJ walked to the dais to give his first State of the Union address, on January 8, 1964, just a month and a half after President Kennedy had been assassinated, he looked more like a school teacher—a job he’d held, decades earlier, in an impoverished rural community in South Texas—than the most powerful man on earth. He wore a sedate black suit, white shirt and narrow black tie; his receding hair was cut short and brushed back. There was no bombast, no theatrics. He didn’t begin his speech with an over-the-top eulogy to the recently assassinated John Kennedy; nor did he slash his hands in the air and, as a first step to healing the distraught nation, noisily promise to rain down vengeance on America’s enemies, be they domestic or foreign. And thus was born, fifty years ago this week, the War on Poverty. Shortly afterward, Johnson called on Sargent Shriver, then head of the Peace Corps, to run the Office of Economic Opportunity. The OEO became the nerve center from which would emerge the new institutions and programs and ideas that would, collectively, make up a national anti-poverty effort unlike any that had come before or any that would emerge in the half-century following. Out of this office—made up mostly of young idealists who, at first, unsure of the durability of the effort, kept their day jobs and worked on OEO issues long into the night—came the Community Action agencies, Legal Services and a slew of other transformative systems. The War on Poverty embraced stunningly democratic ideals, seeking to devolve decision-making right down to the community level. It bypassed party machines in big cities such as New York and Chicago, providing funding directly to on-the-ground, grassroots groups. Poor people were given a significant measure of control over their own lives. From a distance, it has become fashionable to lampoon this war, to denigrate it for creating a “poverty industry” rather than eliminating poverty. Ronald Reagan verbally assaulted “welfare queens” allegedly sucking at a public teat swollen by LBJ’s misbegotten war. These days, GOP Representative Paul Ryan talks of food-stamp recipients rocking on a “hammock” provided them by a bloated anti-poverty infrastructure. Rush Limbaugh routinely caricatures America’s poor as ne’er-do-wells lacking the will to succeed and taught by post-LBJ politicians that all their needs would be taken care of by a nanny state. In fact, Johnson’s anti-poverty measures—and it should be noted that they also became Richard Nixon’s efforts, less empowering but still remarkably bold—were tremendously successful. In the decade following LBJ’s 1964 State of the Union address, the poverty rate in America was virtually halved. The expansion of food stamps, and of other nutritional programs such as free and reduced school breakfasts and lunches, led to enormous drops in hunger and malnutrition. Medicare—technically not a part of the War on Poverty, but a keystone of the related Great Society programs—was particularly effective in providing financial security to elderly Americans. And with institutions such as Legal Services, an extraordinary network of legal resources was established for low-income Americans, resulting in a number of critically important Supreme Court rulings. That the War on Poverty didn’t completely eliminate economic hardship ought not to negate its significance. And that poverty was allowed to bounce back from the Reagan years onward ought to stand not as a critique of the War on Poverty but rather as a reminder of what happens when a country ceases to make the well-being of its most vulnerable residents a priority. Let’s be clear about one thing: poverty has not been exacerbated by expensive anti-poverty programs, or because the country somehow ran out of funds. Rather, its resurgence is the product of a set of political and economic priorities that has allowed those who already have the most to accumulate ever more money and influence, at the cost of starving basic investments in public infrastructure, in that web of “opportunity” that LBJ envisioned. The consequences have been extreme. Because of these trends, poverty would likely have deepened even without the calamitous events surrounding the 2008 financial meltdown—as it did throughout the George W. Bush presidency. That meltdown has made conditions far worse. Today, 50 million Americans live below the poverty line. Nearly one in four kids live in poverty; in some Southern states, it’s as many as one in three. Tens of millions of Americans rely on food stamps—now under assault from conservatives—to avoid hunger, and millions more, deemed too affluent for food stamps, rely on private charities: soup kitchens, food pantries, churches and other religious institutions. No other Western democracy has the numbers in deep poverty that America has. No other wealthy country has done a worse job of protecting children from the ravages of poverty. For too long, President Obama has largely ignored this catastrophe, talking far more about the “struggling middle class” than about those who have never risen into, or have fallen far out of, that stratum. In December, however, he gave a blistering speech at the Center for American Progress identifying poverty and growing inequality as the central domestic challenge of our age. He was right to so do. But now he needs to commit more than just words to his anti-poverty effort. When Obama delivers his 2014 State of the Union, he will probably pay tribute to Johnson’s War on Poverty. But anniversary tributes are the easy part. The hard part will be to marshal the moral energies and political imagination of the nation behind an anti-poverty effort as ambitious as the one launched by LBJ. This is an existential challenge. Poverty’s consequences are devastating—to individuals, to communities and, ultimately, to democracy itself. It demands a response from President Obama as ambitious and as wide-ranging as the War on Poverty that Lyndon Johnson launched fifty years ago.